The Pitt baseball team seemed primed for a rare sweep on a summery Saturday in late March against Virginia Tech. The Panthers were up 4-0 in the top of the fifth in the second game of the series. Redshirt junior pitcher Matt Pidich was on the mound and had yet to allow a baserunner. The third and final game of the series was coming up later in the afternoon. A win would bring much-needed momentum for a team 1-5 in ACC games so far. But a leadoff walk took away Pidich’s perfect game, and a hit right after stole the no-hitter. He rebounded by forcing a fly out, but then walked another batter to load the bases. 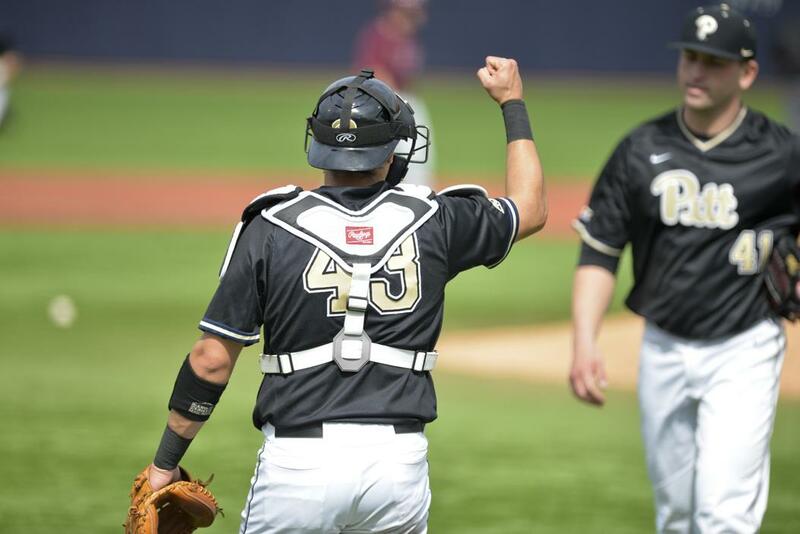 So, Pidich stared over his mitt, into the eyes of his catcher: the steady senior Manny Pazos. Looking at Pazos’ experience — four years of starting 20 or more games behind the plate — Pitt head coach Joe Jordano had a stoic description of the catcher. Whether the next pitch will be a 95-mph fastball or a curveball buried in the dirt, Pazos is unfazed. “He’s a rock back there,” Jordano said. Right now, Pazos is hitting a little over .200. Jordano has described Pazos as “streaky with the offense,” with an occasional game-winning hit. But give Pazos a chest protector — or put him in front of a grill with a spatula — and he’ll find ways to contribute to the team. And despite Pazos’ hard work hitting the gym and building a shorter, more compact swing to punch balls to the opposite field — he is happy to be the team’s backstop first and foremost. “You try to hit whenever you can, but your defense definitely comes above everything else,” Pazos said, with a big smile he flashes often. Finding his way to contribute to the team took time, even for Pazos. Coming from a Cuban family, he’s been around the game so long he can’t even remember his first few swings. “My mom’s told me stories of me holding a soda bottle in the crib acting like it was a baseball bat,” Pazos said. In Cuba, his dad played baseball, and “probably could have” made the country’s Olympic gold medal-winning national team. But his dad gave up a shot at glory on the island to bring his family to America. “That was a lot for me to process. Like, holy crap, my dad gave up a lot just to be here,” Pazos said. Pazos was four years old when his family left Cuba and resettled in Miami. He was already taking the field by then, following the path of his father — though his mom also helped her son learn, occasionally throwing on a helmet and working with him on his swing. Back in Pitt’s sunny stadium on Pitt’s upper campus, Pazos headed up to the mound to meet with Pidich and prep for Joe Freiday Jr., the next Virginia Tech batter. Pidich and Pazos have been teammates for most of their career at Pitt. Over that time, Pidich has learned to appreciate Pazos’ goading behind the plate. After the quick conversation, Pazos returned to behind the plate, sank into a squat and got his glove at the ready. When growing up in Miami, Pazos originally played the middle infield. But as he grew up, his coaches noticed a strong arm and Pazos’ desire to have a say in the game. So, as a sophomore in high school, he settled into his first crouch behind the plate. He’s remained at the position ever since. Usually when he leaves a meeting on the mound, Pazos tries to leave his pitcher with a confidence boost. “I try to tell our guys, ‘You’re the best guy up there. I wouldn’t have anybody else pitching at the time,’” he said. On that afternoon, his words worked. Pidich bore down and struck Freiday Jr. out, leaving three maroon-clad Hokies twitching nervously on base. Pitt had two outs, but the threat wasn’t over — up to the plate stepped dangerous slugger Rahiem Cooper. The Virginia Tech outfielder had already hit six home runs and drove in 23 runs in 24 games to start the year. One swing of his bat could tie the game and change the Panthers’ whole series. Keeping a team loose for high-pressure situations like this — bases loaded, four-run lead, power hitter at the plate — isn’t something a few words on the mound can fix. It’s a long-term project. Pazos tries to lead the relaxation efforts because “we’ve got to get our minds away from the game a little bit sometimes.” That means you might find him behind a grill, cooking up hamburgers and sausages for hungry teammates on a day off. All that preparation and quiet-yet-stern leadership from Pazos shows from the dugout, according to his coach. Jordano thinks the senior shines brightest under intense pressure. Pazos and Pidich wasted no time with the batter. Within a few pitches, a dull whack from Cooper sent a soft ground ball up the middle. Pidich snagged it and tossed the ball back to the second baseman, for the inning-ending out. Immediately, Pazos stood up, let out a holler, and raised his fist high in the air. He and Pidich walked up and slapped each other on the back. As the two walked back to the dugout, they clasped hands with the rest of their teammates in celebration. Those jams are the moments that make Pazos happy he’s playing baseball from a crouch.